Starting with version 4.0 of Setlist Helper for Android you can automate several actions. Actions are executed when you tap the “Play” button at the top of the screen. In addition, they will be executed when you double tap the lyrics view. To customize the actions make sure you are on the Lyrics view. Tap the menu button in the upper right and choose “Actions…”. You will see the following screen. The screen above show the actions that are default when the app is first installed. 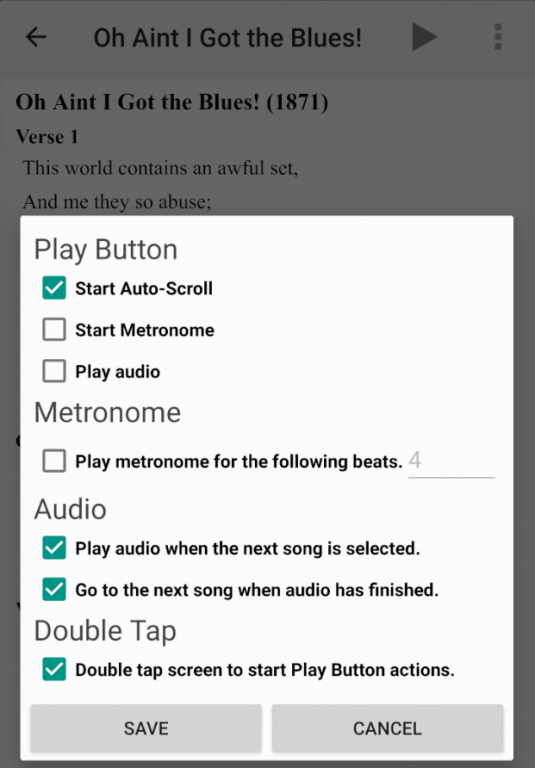 Start Auto-scroll – This will start scrolling the lyrics. When the “Play” button is tapped a toolbar will appear that lets you adjust the scroll speed. If you double tap the lyrics to start the actions the toolbar will not appear. Start Metronome – This option will make the metronome appear and start with the current tempo of the song. You will need to manually stop the metronome. Play Audio – If you have audio attached to a song the song will start playing. Play metronome for the following beats – If you have “Play Metronome” checked the metronome will play the click for the beats you specify. The metronome will continue silently after the beats of gone silent. Play audio when the next song is selected – When you swipe to the next song the audio will automatically start. Go to the next song when audio has finished – When the audio has reached the end the next song will appear.